It’s like a throbbing, reclining ogre, with smoke bellowing out of its many crevices and an unbearable stench seeping into everything surrounding it. Hawks and eagles hover over its dark grey slimy bulk, picking up rotting flesh and melting bones. This is the Bhalaswa landfill at the entrance of India’s capital. 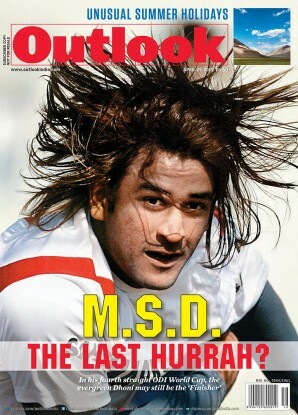 If you are driving into Delhi from the north, through the Karnal highway, this is the first sight that will greet you. Or if you are coming down from the verdant hills of Uttarakhand, passing the vast, fertile Gangetic plains of western Uttar Pradesh with its golden fields, the toppling mountain of garbage of the Ghazipur landfill on the left is the sign that you are about to enter Delhi. It is the city’s greatest problem: solid waste management. The Bhalaswa landfill is where most of north and west Delhi’s garbage is brought and dumped—the main reason why the Supreme Court came down heavily on the administration early this month, saying the city “would go down under garbage one day”. The court, while ordering all states and union territories to frame policies for the disposal of solid waste, singled out the Ghazipur landfill as the most obnoxious. Delhi has three waste-to-energy plants near landfills, but they are mostly idle. the landfill at bhalaswa gets the most garbage per day, but has no plant nearby. As you climb atop one of the landfills, or ‘dumping grounds’, a post-apocalyptic hell greets you. First to assault one’s senses is the stomach-churning odour of rotting waste, even before one can see the garbage strewn around—in mountains of waste or peeping out from the ground where it was buried a while back. Vultures swarm around on top of the dump, while hounds mark their territory on ground. The methane emitted from the waste causes fires every few metres, which are either let to stew or doused hurriedly by an employee of the municipal corporation. This is Amit Pratap’s everyday workplace. 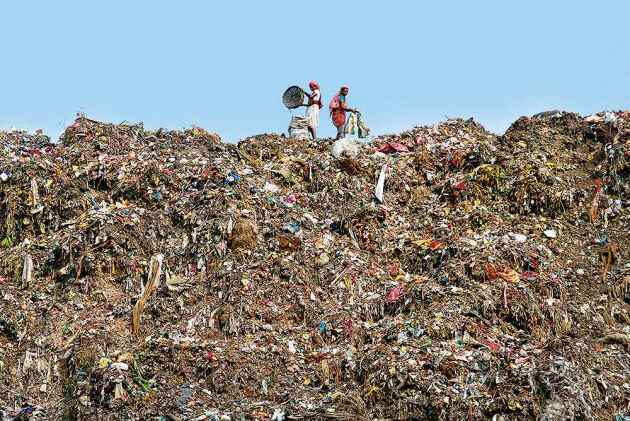 A Dalit emplo­yee of the North Delhi Municipal Corporation, Amit has been working on the Bhalaswa landfill for more than 15 years now, directing trucks of garbage into the landfill. It may look like a simple job, but it’s 300-400 trucks every day. Each truck carries around six tonnes of waste collected from dumping points around the northern parts of Delhi—­that’s more than 1,800 tonnes. “We get all sorts of waste material here; from clothes to industrial waste to household garbage and plastics,” says Amit, pointing out that there is no mechanism for segregation of waste at source in the city. Used since 1994, the bhalaswa landfill reached its waste limit in 2007—estimated at 15 million tonnes, the weight of 10 ­nimitz -class ­aircraft carriers. Delhi produces around 8,300 metric tonnes of waste every day—that’s the official figure, while most exp­erts, including government officials, peg it closer to 10,000 metric tonnes. What happens to all this waste? All this waste is dumped in three major landfills—Bhalaswa for north and west Delhi, Ghazipur for east and Okhla for south. It’s the most primitive method of managing waste—dumping them outside city limits—and even the Harappan civilisation knew better ways. The problem is not simply lack of land; the rot goes deeper. As the amount of waste grows, there’s less funds available to treat it. Add to this a serious lack of innovative technology to treat solid waste, and the landfills only grow every day. The Supreme Court judges may have exaggerated when they said the landfills would one day touch Qutub Minar’s height—73 metres—but only slightly. How big the mountain of trash has grown is indeed shocking—the Bhalaswa landfill, the biggest in Delhi, today stands at roughly 55 metres, almost double the prescribed height. “The MCD (Municipal Corporation of Delhi) laws don’t mention the maximum height of the landfills, but international standards dictate that such landfills cannot exceed 25 to 30 metres,” says a ground engineer at the site, who wished to remain unnamed. And not just height, their capacity to hold waste has been far exceeded. For example, the Bhalaswa landfill, used since 1994, reached its waste limit in 2007 with an estimated 15 million tonnes—roughly the weight of 10 Nimitz -class nuclear-powered aircraft carriers, the biggest in the world. The city’s oldest landfill—in Ghazipur and used since 1984—reached its limit in 2004. In fact, no landfills have been made according to the regulations and norms required for their construction. They don’t have an impervious membrane lining the base of the landfill to ensure that the toxins from the landfill don’t seep into the soil and contaminate the water. Such measures are standard procedures in landfills across the world, like in the US and China. According to Dr Manoj Datta, a solid waste management exp­ert teaching at IIT-Delhi, the landfills lack proper designated wells to collect the leachate and methane emissions, and have steep slopes resulting in a lack of stability, making them dangerous. Last year, the Ghazipur landfill collapsed under its own weight, killing two people. “The landfills were created at a time where attention was not paid to such details and we are now facing its consequences,” says Datta. If inert waste (like Malba) is segregated from other waste, it can be used in infrastructure projects such as laying roads. The main reason for the failure to contain such landfills is the rapid unplanned development around them, says Pradeep Khandelwal, chief engineer, East Delhi Municipal Corporation. “More than 75 per cent of the area around such landfills is now occupied by unauthorised colonies, inhabited by people who make a living out of the landfills,” he says. While Ghazipur banned rag-pickers from ent­ering the landfills after the fatal accident, the settlements around Bhalaswa are almost solely dependent on col­lecting garbage and selling it. Moreover, the lack of an efficient system for segregation of waste at source has complicated the issues of managing waste. “More than 30 per cent of the waste this city generates is inert material, including construction waste, while about 50 per cent is biodegradable. 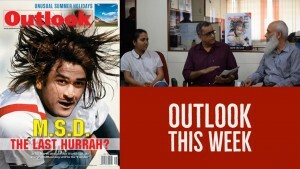 Both need to be treated very differently,” says Datta. The original idea behind creating these landfills was that the waste collected would be burned in a furnace to produce electricity. Though Delhi has three waste-to-energy plants near the landfills in Ghazipur, Okhla and Narela, there have been no means to manage them since the trifurcation of the MCD in 2012, leaving them almost idle. Bhalaswa doesn’t even have one despite getting the most garbage per day in the city. No wonder only a negligible amount of electricity has been produced from the waste in Delhi’s landfills. The Ghazipur plant produces 12 MW from about 2,000 tonnes of garbage, while the Okhla one has a capacity to produce 12 MW from 1,200 tonnes. This is painfully low—a typical household uses about 27 kW of energy every day, so 12MW isn’t even enough to provide electricity to 50 households a day, in a city of 36.26 lakh households. In fact, waste-to-energy plants may already be an outmo­ded concept to dispose off garbage as the waste is burned to produce energy. Now, there is a school of thought that believes burning this waste is environmentally hazardous (See page 42). Researchers and specialists have suggested several other ways to deal with the issue based on international practices, but most have been just trashed. One of the most effective ways followed by several countries, including Ireland and ­Japan, is incineration plants that burn the waste to ash, which is then sold and put to other uses, such as construction of roads. “Such a method aims at reducing the volume of waste by over 70 per cent,” says a scientist working closely with the government. “This method requires the segregation of inert material from other biodegradable and non-biodegradable waste. If this is done in Delhi, it is certainly possible to use the waste for infrastructure projects such as laying roads.” This, along with more waste-to-energy plants, can bring down the city’s waste by 30 per cent, but it is impossible to implement until waste is segregated into dry and wet. A study by the National Highway Authority of India (NHAI) and the Central Road Research Institute suggests the use of construction waste in the building of roads and highways around Delhi to find a solution for the steep growth in inert material—i.e. the malba a builder leaves behind at a construction site after the building is complete. NHAI said it could use this humungous inert waste to widen NH-24 into a 14-lane expressway. A memorandum of understanding too was signed between the Delhi government and NHAI in 2016, but the project is yet to take off, though the work on the expressway is in full force. So far, the various measures to improve the condition of ­­the dumping grounds have fallen flat. To begin with, putting in safeguards and making improvements need a lot of funds, but Delhi’s east and north municipal corporations run up a debt of between Rs 500-600 crore every year. The MCD mostly functions on grants by the central government—barely enough to meet its salary bills. “To put in safeguards at the landfills now, say a gas tank and an impervious membrane, would cost the government close to Rs 2,000 crore per landfill. Who is going to fund this?” asks an MCD officer. Putting in ­safeguards and improvements needs a lot of funds, but Delhi’s municipal corporations barely manage to pay salaries. The official’s cynicism is understandable. The recent Supreme Court order may have been scathing, but is it going to shake anybody? Delhi’s landfills are a disaster waiting to happen, and the municipal corporations and the government have to act urgently. A holistic approach to manage the waste is the way out, with enough funds released quickly to implement the plans. Or else, as the Supreme Court warned, it won’t be long before Delhi got buried under its waste.